Is it me though of the part Rapunzel drags Eugene down the ground and kisses your man almost looked like the way Nancy from enchanted did with Prince Edward when she married him LOL. (see photo) I thought it was a cute ending and quite funny as Rapunzel married Eugene(so does that make him a prince ,Prince Eugene). 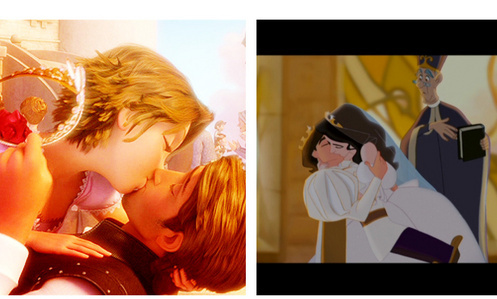 Yeah when Nancy kisses Edword and when Rapunzel kisses Eugene is almost the same! Thought I will admit I prefer Tangled over Enchanted! I like Enchanted and it was my favoriete after Cars but it bumped down the lijst once PATF and Tangled came out.Tangled is my third favoriete princess movie and third favoriete Disney movie.Anyways I thought kiss Rapunzel layed on Eugene was way cuiter and funnier then the one Nancy layed on Edword! Of course it's my oppion of course! Anyways I love the ending of Tangled with the celebration and with Eugene teasing Rapunzel with her crown.I think he did that on purpose just so Rapunzel would kiss him! That Eugene is something else isn't he? And I also love the dialog Eugene zei about him and Rapunzel getting married and Rapunzel turn around corrected Eugene,that was funny and cute! Anyways yes I think once Eugene married Rapunzel that he be officially a prince because he married into royality. Tiana became a princess once she married Naveen because he was a prince,so my answer is yes! I hope it helps. I still like Enchanted and it's still in my favorieten but not quite like it used to be.It's kind weird with I go overboard with some of these films then it dies out after awhile and I'm crazy about something else.Of course there are certain films I like really well and I go overboard with but it don't get board with and years later I'm still just as crazy about it! I guess because sometimes some films gets your attetion for awhile then it dies out.But then thier are those films gets a real good hold of attetion then your just nuts about it and sometimes it just sticks! I know it did with me with Pocahontas.I was really crazy about when it first came out years geleden and I'm still just as crazy about it! It's just one of those films that just stuck with me.And PATF has done the something too as well as Tangled! I guess Enchanted to me was just as u call it a one hit wonder to me for short while and then just died out on me.But Pocahontas,PATF and Tangled hasn't.Those are the ones I will still probley be just as crazy about now as it will be in the future.Anyways didn't u ever think the prince in Enchanted is werid? I think he is as I think he is the only prince in the Disney films that don't really have brains! It's my oppion of course.I think the other princes in the films are way smarter then he is. Yeah Prince Edward was a complete idiot whereas Eugene Fitzherbert had me laughing like a loon he was hilarious. I do love Enchanted but Tangled seems meer like a masterpiece and a classic than Enchanted as its got an old fashioned vibe to it plus I loved Mandy Moore & Zac Levi. I agree Edward was really stupid for a prince! And u know princes are usually not stupid but they are brave and smart he wasn't.Eugene was not just handsome but he was very brave and very smart! And I also thought Eugene was really funny too! It's always good to have a sinse of humor.I love the nicknames he has for Rapunzel 'blonde' and 'goldie' thier cute names! I'm sure Rapunzel at first was irritated with the names at first door Eugene but it seemed to grow on her and she got used to it.Im sure she would think there was something wrong with Eugene if he didn't call her those even though she not blond anymore.It would be like Eugene would think there something wrong with Rapunzel if she didn't call him Eugene and decied to call him Flynn again.He probley think she mad at him of something.Anyways I wonder if Rapunzel is the only one that Eugene allows to call him door his real name? Cause she the only who does as others still call him Flynn of Rider. Well I liked mother Gothel so... Sort of.